Founded in 1865, the International Union of Bricklayers and Allied Craftworkers represents craftworkers in the trowel trades across the United States and Canada. It provides much needed investment to address our urgent school Infrastructure needs. It will stimulate the economy and create nearly 2 million good-paying jobs. This toolkit provides materials for BAC affiliates to push back on so-called right-to-work.It contains sample materials to educate and mobilize BAC members. BAC Members Work on the Largest Nuclear Plant in the U.S.
Over 70 members of BAC Local 8 Southeast, in partnership with BAC's signatory contractor Richmond County Constructors, LLC, are building two nuclear units at Plant Vogtle, the first new nuclear generation to be built in the United States in more than 30 years. Over 70 bricklayers, cement masons, and tile setters of BAC Local 2 Michigan employed by signatory contractors Dixon, Inc. (Detroit, MI), Barton Malow Co. (Southfield, MI), Artisan Tile, Inc. (Brighton, MI), and Boston Tile (Detroit, MI) are working on the $650-million Little Caesars Arena, a centerpiece of the District Detroit. Completed in 1908, the Cannon House Office Building, often called “the Old House Office Building,” is one of the three office buildings to the South of the U.S. Capitol in Washington, D.C. This oldest Congressional office building serves 140 House members and has not been completely revitalized since the 1930s. Fifty-five stone masons, PCC craftworkers, and finishers of BAC Local 1 Maryland/Virginia/DC, employed by BAC signature contractor Lorton Stone (Springfield, VA), are working on Phase 1 of the project to restore the building’s exterior stone, interior marble flooring, totaling 826,000 square feet of space. "My Union is my family." BAC Local 21 Illinois member Helene Brown has been a proud tuck-pointer for over 17 years. 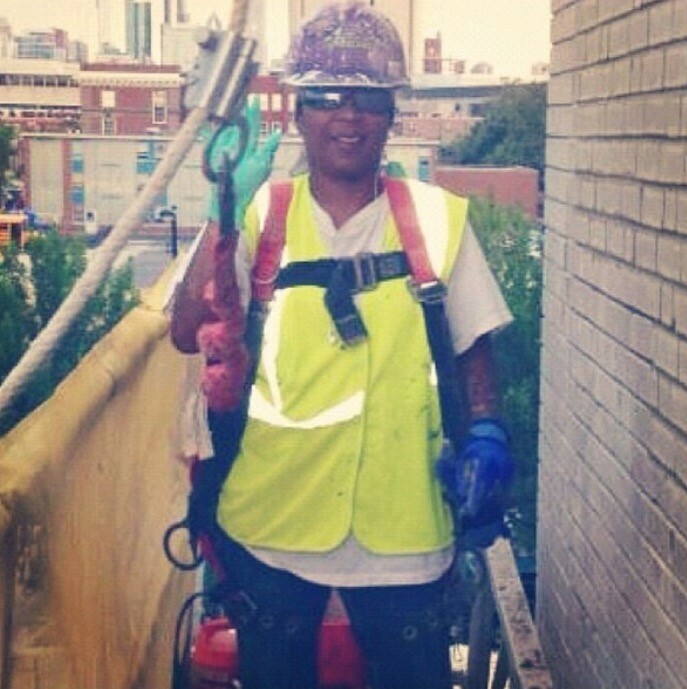 She loves her job so much that she has introduced the building trades to all of her family members including her brother Gerald Brown, two sons Thomas Williams and Carl Williams and niece Jameelah Williams all of whom are PCC apprentices of BAC Local 21 IL. BAC Journal Editors (JE) recently had the pleasure of talking with Sister Brown (HB) about her Union experience and how BAC has impacted her life and her family. BAC membership is represented by Locals and Administrative District Councils (ADCs) in five regions – Northeast, North Central, South, West, and Canada. The International Masonry Institute (IMI) is a labor-management cooperative of BAC and the contractors who employ its members. If you are not a BAC member and would like to learn more about becoming a member, please complete this form and we will send you contact information for the BAC Local Union nearest you. BAC signatory contractors employ the highest skilled and best trained workers in the masonry industry. We provide workers with the best training available, safe jobsites, pensions and healthcare.